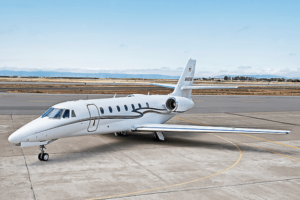 Pacific Coast Jet proudly announces the addition of a Cessna Citation Sovereign super-midsize jet to its charter fleet. This is the fifth charter aircraft added to their fleet of nine managed jets. This aircraft increases the range of available aircraft by providing increased flexibility and convenience for its clients. Pacific Coast Jet is committed to offering a luxury experience while maintaining a price point that makes private jet travel an option. The addition of the Citation Sovereign allows for longer range of flight while still maintaining the advantages of a super-midsize aircraft. Up to nine passengers can comfortably travel in this luxurious stand-up cabin, whether from coast to coast, California to Hawaii or other points afar. This jet is known for its economy, while still providing the level of luxury and performance expected. With only one previous corporate owner, the Sovereign is in beautiful condition. The 25-foot cabin length offers the finest finishes and generous space for baggage and gear. Fifteen elliptical windows offer natural light and stunning views, while state-of-the-art soundproofing ensures a quiet and comfortable cabin experience. The 67-inch ceiling height allows easy stand-up movement throughout the cabin and the adjustable club seating for nine provides flexibility for travel planning. The range of this aircraft is best in its class while still providing the flexibility to take off from short field airports. The Sovereign can take off in under 4,000 feet and its innovative wing design allows the plane to climb directly up to 45,000 feet, reaching cruise speeds of up to 570 mph. Most importantly, the Sovereign is an incredibility safe and reliable jet, with simple flying procedures, many standard emergency systems, and advanced avionics, providing pilots with the greatest amount of information to ensure the greatest safety. Pacific Coast Jet is committed to the highest level of customer service, luxury and flexibility in charter jet travel. Based out of the San Francisco Bay Area, they charter itineraries all over the world. For more information contact us at 888.725.3871.